Secretary of State Mike Pompeo warned the Lebanese government during his recent visit to Beirut that Hezbollah and Iran have set up a new covert factory for precision missiles on Lebanese soil, U.S. sources briefed on the matter tell me. Why it matters: The sources say Pompeo based his warning on intelligence he received from Israel. Israel is greatly concerned about Hezbollah's manufacturing of precision missiles but hasn't responded with military force out of concern that could lead to an all out war. The backdrop: Last September at the UN, Israeli Prime Minister Benjamin Netanyahu revealed satellite imagery of what he claimed were two covert Hezbollah sites for manufacturing precision missiles. A few weeks later, Hezbollah shut down the sites. Now it seems Hezbollah and Iran have opened a new factory. Pompeo visited Jerusalem two weeks ago and met with Netanyahu, who presented him with intelligence which pointed to a new covert facility in Lebanon, the U.S. officials say. 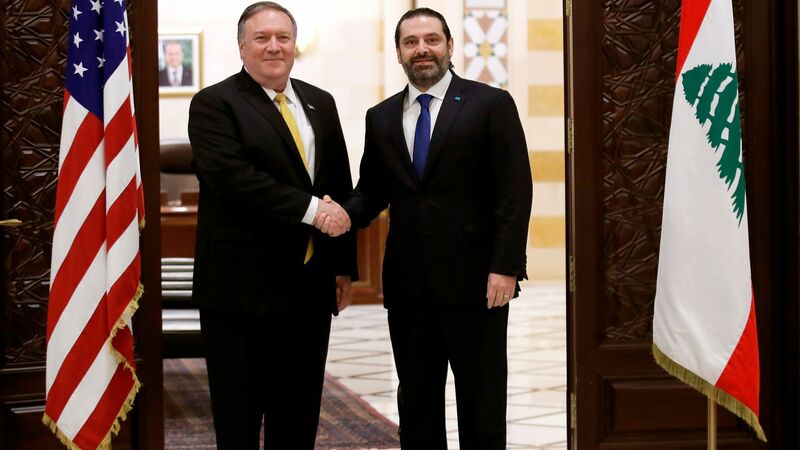 From Jerusalem, Pompeo traveled to Beirut. The U.S. sources tell me Pompeo met with Lebanese Prime Minister Saad Hariri and warned him that the existence of the new covert missile facility could have consequences for Lebanese security. According to the sources, Pompeo told his Lebanese counterparts that Hezbollah's covert operations in Lebanon raise the risk of a real escalation with Israel. Pompeo wanted to make sure that all the information he had about Hezbollah's activities was also known to the Lebanese government, the sources say. The State Department told me: "We do not disclose the contents of private diplomatic talks." A 9-month political deadlock over the formation of Lebanon's new government has ended, resulting in a Cabinet in which Iran-backed Hezbollah has greater influence. The announced power-sharing agreement is unsurprising given Hezbollah’s strong electoral performance last May, when the predominantly Shiite organization and its allies seized the parliamentary majority from a loose coalition favored by the U.S. and led by returning Prime Minister Saad Hariri. The big picture: While U.S. allies in Lebanon were able to impede Hezbollah’s ascendency through protracted negotiations, Hezbollah and its allies now control two-thirds of all key government ministries, with the militant group making further inroads into non-Shiite communities. Hezbollah is firmly entrenched in the Lebanese body politic and has grown into a regionwide fighting force on behalf of Iran, undercutting U.S. efforts to roll back Iranian influence. Background: The Trump administration hopes its economic strategy of squeezing Iran and its allies, which kicked into high gear last November, will allow it to renegotiate the Iran nuclear deal and limit that country’s regional sphere of influence. In Lebanon, however, this remains unlikely owing to Hezbollah’s increasing ability to hide behind legitimate state institutions and benefit from their resources. In an apparent effort to blunt the impact of recently enacted U.S. sanctions on its finances, Hezbollah also secured a “service ministry” for the first time. Its control over Lebanon’s Ministry of Health, with an annual budget exceeding $469 million, could help ease the group’s financial pinch by allowing it to provide patronage at government expense. Reality check: If Trump intends to aggressively pursue Hezbollah’s pocketbook, he will need to make hard decisions that could imperil Lebanon’s fragile political and financial stability, reversing a policy that prioritized containing the fallout from the war in Syria. This would entail scaling back military cooperation that the Pentagon deems important for the war against the Islamic State, or ISIS, and al-Qaeda, ending humanitarian assistance meant to alleviate the burden of hosting millions of Syrian refugees, and slapping sanctions against a good portion of Lebanon’s political elite for enabling Hezbollah. The bottom line: If near-term stability in an otherwise turbulent region remains paramount, then the solution to the U.S.' Hezbollah problem will have to wait for a potential understanding with Iran. Firas Maksad is the director of Arabia Foundation, a Washington think tank. He is also adjunct professor at George Washington University’s Elliott School for International Affairs.